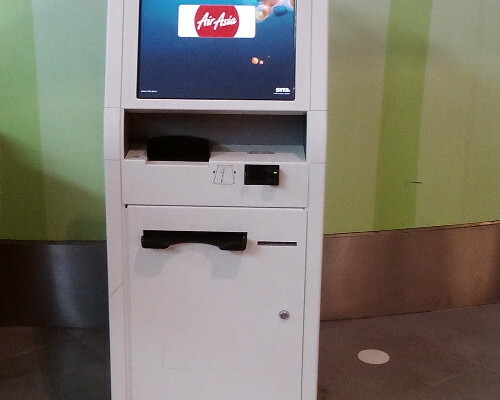 Many aviation carrier has promoted kiosk check in, same action for Air Asia, the world famous low cost carrier. 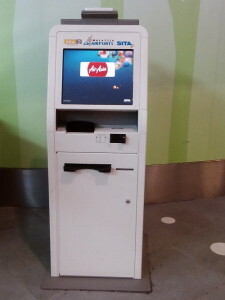 AirAsia also promotes kiosk check in in KLIA 2 airport. We are seeing AirAsia is increasing passenger through out the year. Base on the pass development, AirAsia has moved from LCCT terminal to KLIA 2 terminal since year 2004, this new KLIA 2 airport is much bigger than LCCT to cope with increasing passenger. Apart from moving to new facility, AirAsia also promotes kiosk check-in. While I am travelling abroad, I am seeing many airline carrier such as Cathay Pacific in Hong Kong also promotes kiosk check-in at Chek Lap Kok airport. Y-generation is the generation live with smartphone. Many information has been stored in the smartphone include flying itinerary. Instead of printing the flight itinerary, the passenger tends to show their flight booking number or ticket number to check in counter. Save paper printing. Passenger do not require to print this itinerary or flight information for check in purpose. Save man power. The flight carrier, Air Asia could save some extend of man power as the check-in activity is carrying out by kiosk and passenger. Streamline check in procedure with minimize que time. The check-in kiosk only handle the check-in process, but not baggage drop-in. Hence the process time is shorten and faster. Passenger still have to proceed for baggage drop after the check-in at kiosk. Implementing kiosk check in or internet check in is definitely the trend for current aviation carrier activity. Especially we are facing difficulty getting services personnel. Many activities or services has been transferred to self-service kind of activity, and kiosk check-in is also part of the activity. Less check-in counter. 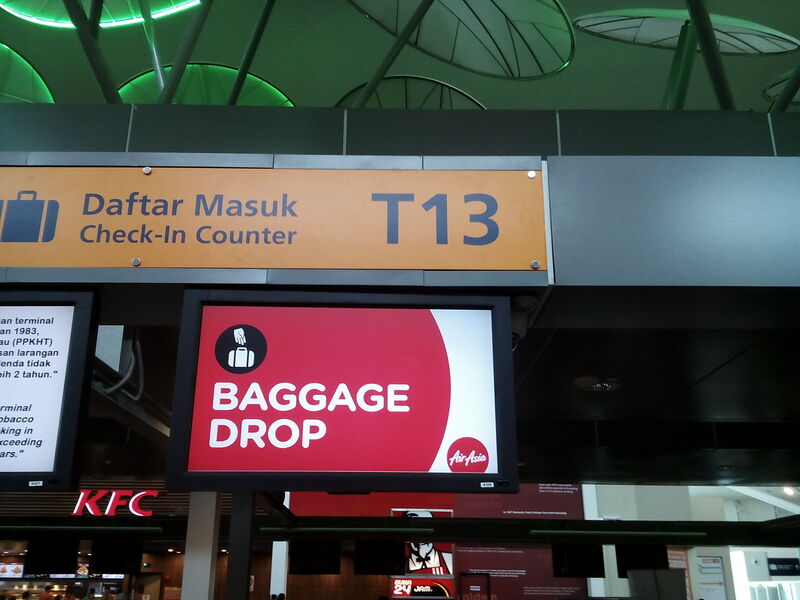 Many of the Air Asia check in counter in KLIA2 airport was converted to baggage drop off counter. Passenger has to tolerate longer que if you want to perform counter check-in. Collect charges for counter check-in. For domestic passenger, Air Asia is collecting RM10 per passenger who want to perform counter check in. Increase check-in kiosk availability and assesibility. I am seeing many check-in kiosks located along the passenger baggage drop-off route. User friendly kiosk check-in interface. Check-in with the kiosk is simple and straight forward. Passenger only have to follow the instruction appears on the screen and with minimum data input. As long as you have the below 2 information, you are qualified for using the check in kiosk. Flight booking number. You can select scaning the barcode on the flight booking itinerary or manually input the 6 digit ticket booking code. Passport. You have to carry along your passport while performing the kiosk check-in. You will be requested to place your passport on the destinated place so that the kiosk will read the passport info to act as a proof for personal identify their existence. Once your check-in is successful, the check-in kiosk will print out a nice boarding pass showing your boarding details. With this newly printed boarding pass, you could proceed to baggage drop counter before entering the immigration area. Overall speaking, it is still very convenient using the check-in kiosk. With minimum English literature needs, you could understand the procedure and action needs in order to accomplish the kiosk check-in. 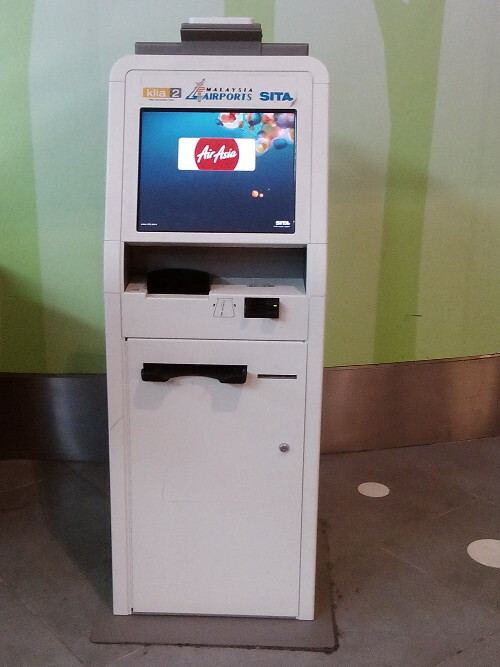 Next time while you are flying via KLIA 2 airport, please pay your attention to this kiosk, maybe you want to try using this check-in kiosk too! This entry was posted in Travel. Tags: airasia, airport, ticket.